In all seriousness I constantly think about what albums I will take with me if Earth goes to hell and I have to live in space or another planet (which I honestly hope does not happen, did no one see Alien?). Kyle Andrews took it one step further, he thought if the world was going to end (remember that whole Mayan Calendar thing back in December?) what kind of a document would he leave behind? 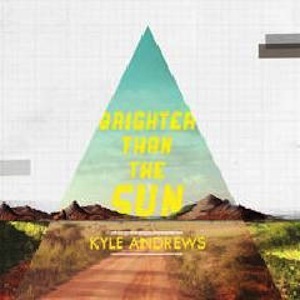 If for some strange reason, this is the final Kyle Andrews record, (by his choice or the world’s) Brighter than the Sun is not a bad way to go out. Andrews stacks layers of synths on top of synths to create an extremely slick and danceable pop record. Andrews has crafted an extremely catchy record with multiple sing along jams like “If You Want to Shine,” and ” Brighter Than the Sun.” The closing track, “The Way to Wonder” is the strongest song on the album, and I will argue one of the of the most masterfully crafted pop songs of the year. The track begins unlike the previous nine tracks, an acoustic guitar and hand claps, but it slowly builds with slicing synths and a pounding bass drum that compliments a dynamite melody and chorus. It’s an album that breathes hope, positivity, and an outlook that tomorrow will be a new and brighter day. It’s as if Andrews doesn’t expect the world to end but that our lives can only get better if we only imagine it.